One of the common problems found when fitting SEEP point motors to PECO pointwork is trying to get the point motor to fire correctly to both sides with the auxiliary switch working cleanly either side of centre. This is caused by the throw of the PECO point being somewhat less than that of the point motor. 4. Use round-headed screws to make sure that the point potor is firmly held in place while allowing it to be moved along its axis. 5. 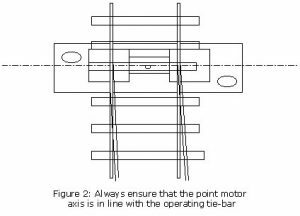 Before tightening the point motor ensure that the operating bar is in the centre position between the solenoids. This method should ensure that the motor operates correctly and that the switch always operates cleanly to the side that is required.